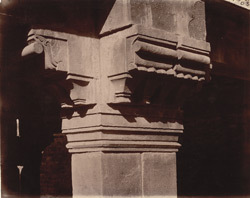 Photograph of Mariam's House, or the Sunahara Makan, or the Golden House, taken by Edmund William Smith in 1893, from the Archaeological Survey of India Collections. Fatehpur Sikri, was a palace city built by Emperor Akbar (r.1556-1605) between 1571 and 1585. The house in this view was the residence of Emperor Akbar's mother, Miriam Makani, and was originally covered with paintings and gold decorations. The oblong house stands on a platform and is surrounded by a verandah on three sides. There are four rooms on the ground floor and three on the first floor from where a steep staircase leads to the flat roof which is covered by a pavilion at its northern end.